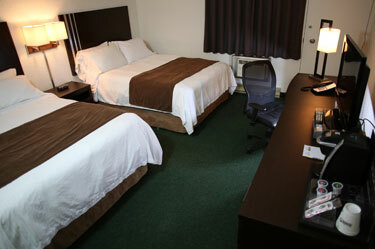 Our Double rooms offer two double sized beds, all the amenities listed above, and are City View. We also have pet-friendly rooms available in this type. 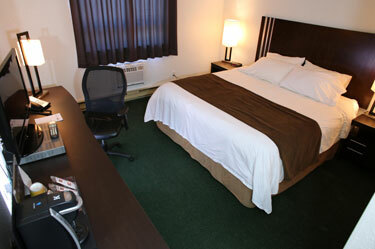 Our Queen rooms offer two queen sized beds and all the amenities listed above. Queen rooms are either Pool-Side (main floor) or Pool View (second floor) and have direct access to the pool area. Our King rooms offer one king sized bed, all the amenities listed above, and are City View. We also have wheelchair accessible available in this type. *Let us know what you’re in town for, you may be qualified for a special rate! Certain rates qualify for 2 free breakfast coupons per room, per day, Monday to Friday only. Ask a Front Desk Agent for more details. **We have a limited number of cots available on a first come first serve basis. Government and commercial $119.75; Senior $109.00; Snowmobilers $115.00; Sports $115.00; Louisiana Pacific $115.00 and lastly a weekly rate of $115.00 per night. These take effect September 1, 2018 and onwards. Be sure to ask our front desk staff if any of these rates apply to you.